Family Impact Network (FIN) is a collaborative public-private partnership with each party playing critical roles. An important role for FIN is to collect, analyze and share important data about what’s happening in the field to provide rich information for social workers to use in their decision making, and for providers to use in their practice development. A sophisticated data system, with a program called OLIVER, will allow FIN to support providers in achieving high impact results that improve service delivery and ultimately reduce out of home placements. 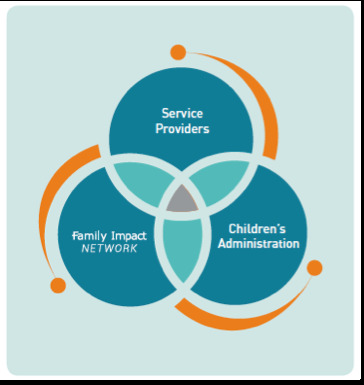 Partner with Family Impact Network to create an enhanced method of service delivery. Set policies to safeguard and support Washington’s children and families. Hold the ultimate responsibility for child safety and decision making about each case. Foster and support innovative services and approaches. Serve as the Network Administrator to allow for innovation, increased transparency, leveraging of data, and supports service providers. Develop an integrated data system that allows for data-informed decision making and improved coordination of services. Serve as the heart of the system, providing best-in-class services to Washington’s most vulnerable children and families. Work in communities to meet the needs of our most vulnerable children and families. Address the needs of children exposed to trauma through comprehensive approaches. Incubate the Family Impact Network. Convene and leverage the reach of multiple organizations.